I've got a thing for texture! Especially the micro glitter ones and find them very suitable for nail art. When I saw this post from my friend Leslie at work/play/polish I knew I had to recreate one day. My stripes are most definitely inspired by hers! 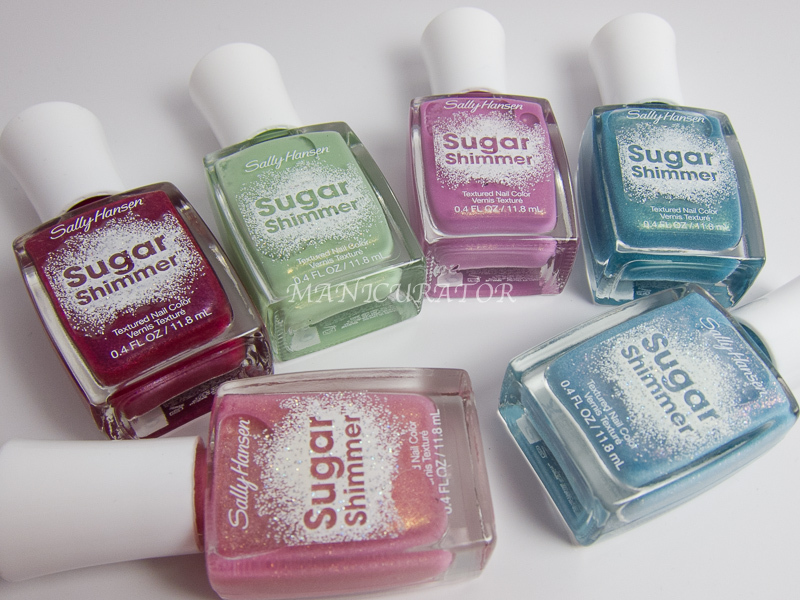 I received 4 of the 6 Sally Hansen Sugar Shimmer to review and I love them so much I ran out to purchase 2 more :) Before I show you what I created...did you catch my last post? Sally Hansen is sponsoring their second annual I Heart Nail Art contest, plus I have a giveaway! Are you going to enter? 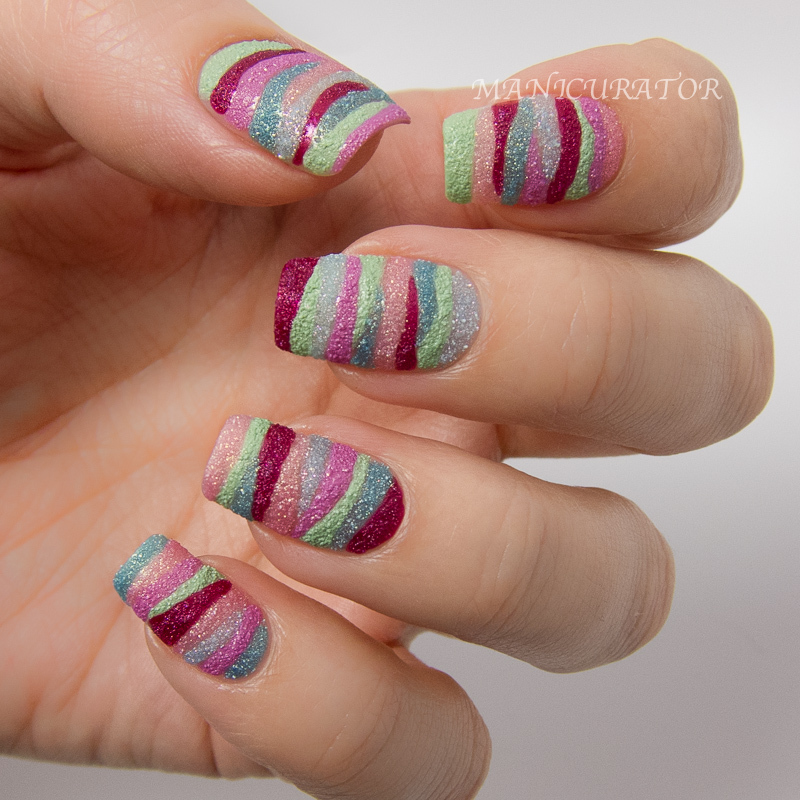 I just used a small nail art brush to paint of these stripe like sections. I went over it for a second coat and third coat to make sure all the shades were saturated. I really love how these turned out and wore them for quite a while. Another bonus of texture polish is I find they wear like iron. Are you on the texture train? Which is your fave? There are two more in this collection that I don't have yet. Pretty sure I'll grab 'em next time I see them! Oooo I'm reminded of those bottled sand stands at a festival where you layer different colored sands, tipping the bottle this way and that to create pretty patterns! Also, that red has just made it onto my must have list!! I love textured nail polishes and this color combination looks gorgeous! 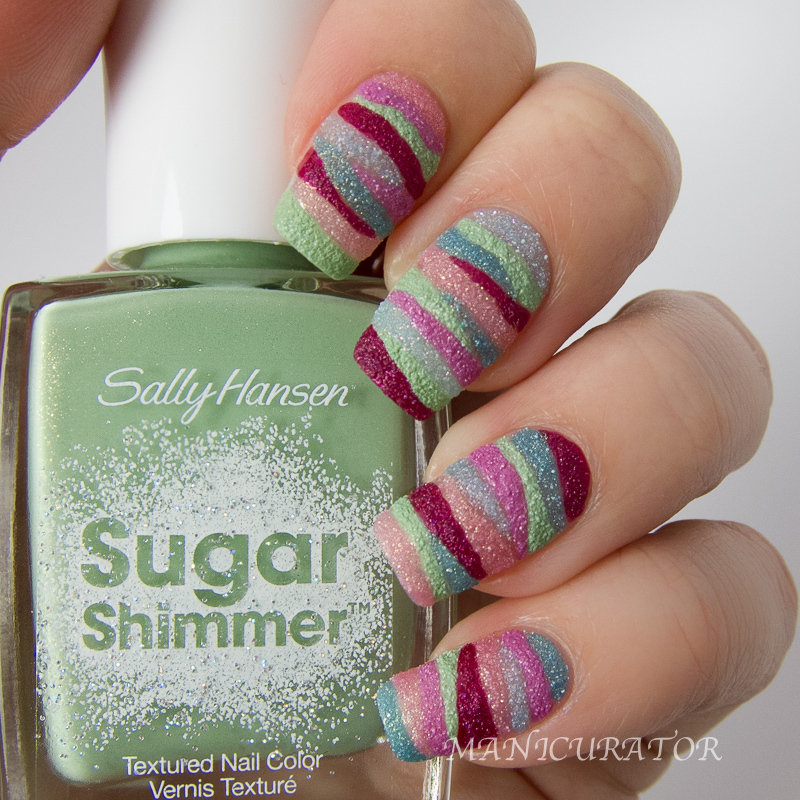 This is such a fun manicure! I love the colors! This is such great use of texture! This looks so amazing! Awesome job! Hi...I loved Cinny Sweet but wasn't thrilled to read your comment about how it stained (nice use of an ellipsis, btw😉). May I ask, did you use a base coat with Cinny Sweet? 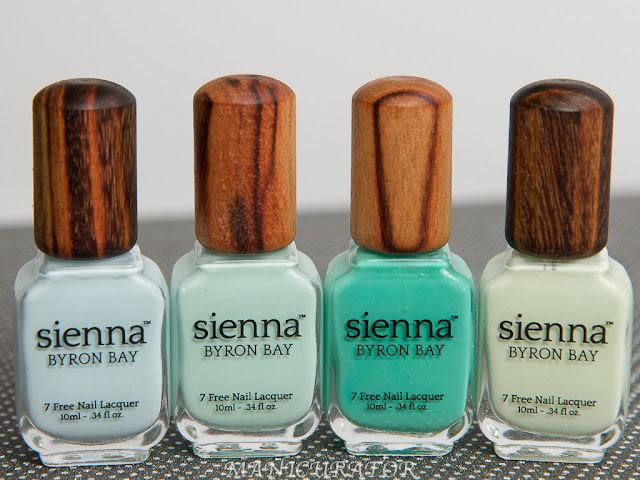 If you did, do you remember what base coat? Thank you! Hi...very nice detail work! Do these particular texture polishes come off easy with acetone or is it more like taking off glitter? Thank you! I applied it just before a short trip with only 1 coat of Revlon base coat; next time I'd definitely use 2 generous coats . I might even try Glitter A-Peel with this one. I removed it during my trip, and what really worked well was using the remover in the little jar with the foam piece. When I twirled my finger, the color transferred to the foam and not all over my fingers. This was after using cotton for the first couple fingers - very messy. I'm still looking forward to wearing this again after summer's lighter colors. Hope this helps! Gorgeous! Wow! Just love them! I could not possibly love this more!!! Sorry for the late reply! Your information really does help. I'm a sucker for ruby colors so I'll probably give this a try and will double up on the base coat. Thank you so much! I hope you don't mind me jumping in with my two cents' worth here. I have a couple of these colors, and find removal easy. If you let the remover sit on the nail (I almost always use foil anyway) and let it do its job, it will dissolve the polish in a few minutes. They are much easier than glitters to remove. 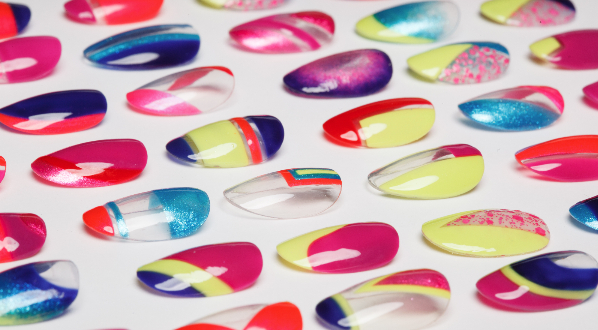 Don't rush the process and don't scrub the nail beds. Hello, again...nope, don't mind a bit...grateful for any and all nail advice, actually. :) I have learned to press the cotton ball with acetone to my nail for a minute or so before sliding the polish off, usually, all at once. I started doing that for glitter but now do it for all polishes. I've only worn texture polish maybe twice (it's not my favorite, I do like a glossy nail) and it's been awhile so I wasn't sure about removing it. However, I have noticed lately that the skin on the pads of both index fingers and thumbs has become quite dry. Of course, they are the fingers I use to "grip" the cotton ball on all my fingers. I do know about the foil method (seen videos and tutorials), but always thought it looked like a waste of foil. Nowwww, however, the foil technique looks like the answer to my poor, dried-out skin. Thank you for mentioning it! That's why I always let the foil do the gripping, or I'd have the same dryness problem! You only need a scrap or strip of foil to wrap around the nail to hold the cotton ball in place. Very little waste, really. Hi again! Just wanted to share that I had no staining with Cinny Sweet so I hope you don't either! Thanks!! I'm loving all of these shades for sure! Totally! I wasn't thinking it when I made it but others have had the same comment and now it's an obvious association! Thanks!! I love them together too! Not a huge fan of texture, but these look great on you. Aw thanks Debbie! That means a lot!